I thoroughly enjoyed Moriartys’ Big Little Lies and selected Truly Madly Guilty as my second read of hers. I enjoyed switching between the viewpoint of the various characters during the novel. From the get go there was a large amount of character building. I usually enjoy this style of writing but in this case it felt as though I was trudging through half the book before any of the plot began to play out. As a result I took a break in the middle of reading the book because I was sick to death of the ” day of the barbecue” drama that was always alluded to and never stated. After the build up ended and the reader finally got to find out what happened on the day of the godforsaken BBQ the plot picked up nicely. From then on I couldn’t put the book down and ended up half asleep at my desk in work the next day after finishing reading the novel – Note to self : Don’t read until after 3 a.m when you have to be up at 7a.m for work. As the final pieces of the puzzle came together, my heart broke for a character whom I held no regard for in the previous 99% portion of the novel. A mark of Moriartys masterful skill at building a relationship between characters and the reader. 3.5 rounded up to 4 for GR. When I happened upon Holding, I couldn’t help but be a little sceptical as the novel is written by the fabulously funny chat show presenter Graham Norton. I was quite glad to be proven wrong and have been praising the novel from the rooftops. Set in a quaint village in south of Ireland, where Norton more than likely drew the inspiration from his childhood growing up in Ireland, we meet the various characters you would come across in a village : the Garda (policeman), the shopkeeper, the farmer and his wife, the school teacher, the spinster, the housekeeper. On the discovery of a body in the nearby woodlands, decades old secrets and lies are uncovered which result in the lives of the villagers to be entwined irrevocably. Cormoran is giving me a coronary . Hurry up with the book. I need it yesterday. Ok firstly I have to say that the third instalment in the Cormoran strike series is by far my favourite so far. In the previous installments I had a sense of where the story was going and who the murderer was but I couldn’t make head nor tail of anything in Career if Evil. Jo, you kept the suspense up that’s for sure. Cormoran strikes assistant Robyn arrives to work one day to find a courier waiting with a package for her. She signs for it believing it to be something wedding related that she has ordered as she is due to marry her fiancé Matthew the following month. However she is in for a rude awakening when she opens the package and uncovers a severed leg . Cormoran believes that the culprit is one of three men he has history with, one being his former stepfather and the other two being former colleagues in his army life. Career of evil sees Cormoran attempt to uncover which of the men is involved in the crimes all while juggling his struggling business, his new flame and his confusing feelings towards his soon to be wedded assistant.– by the way, I loved the character development of Robyn even though it was tough to read. One thing I will say is that in comparison to the rest of the novels , the extent of the violence and crimes committed were beyond gruesome. A couple of descriptions were hard to stomach. This is one instance where I’m going to bite the bullet and just say it…..
Um, yeah, that is all. 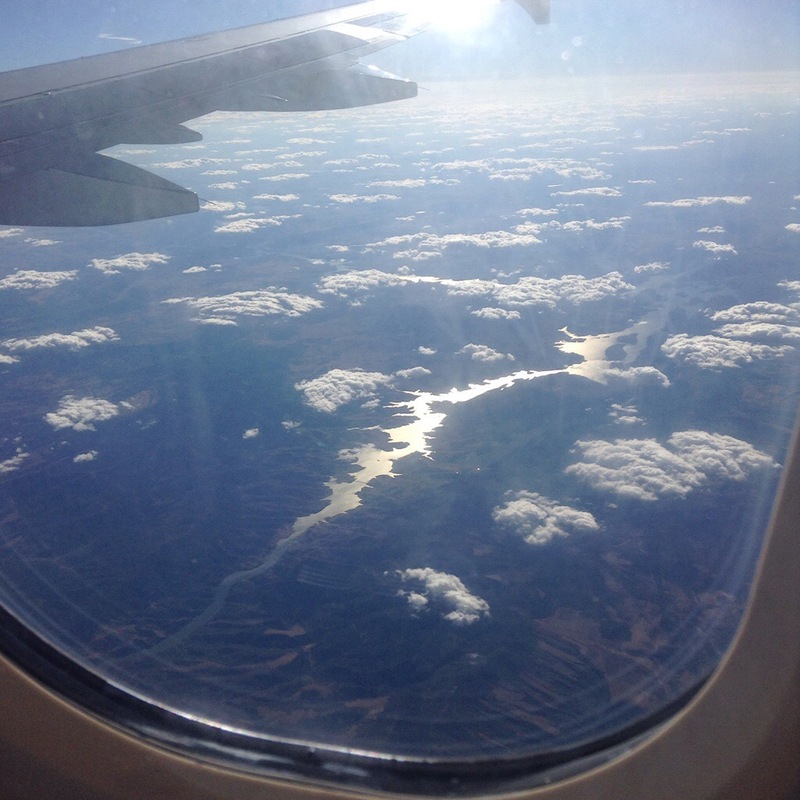 This photograph was taken on a flight to Malaga . It was taken about 20 minutes prior to landing but I don’t really know where it was taken. But I took this picture because for some reason I’ve always thought of beaches in relation to Spain. For some bizarre reason I never thought of there being lakes. Right. Where do I start with this one? To begin with you have to gather all your cop on and common sense, stuff it into an old rucksack, fill it with rocks and throw it in to a lake. Because you are about to read some freaky creepy happenings. Our main character is Chloe. When we first meet her she is hanging out with her older sister Ruby and a group of Ruby’s friends at the local reservoir. Ruby has a way with people and story telling and enjoys creating high impact stories to relay to her friends. Ruby proclaims that Chloe is an extremely talented swimmer and wants to create a story for her friends. In the midst of completing a dare to swim across the reservoir Chloe stumbles across a disturbing discovery. A girl from school named London is laying dead in a boat within the reservoir. 2 years have passed by. Chloe is living away from Ruby with her stepfather. Unexpectedly Ruby comes back into Chloes life and provides her the means to get back home. As Chloe gets back home and bumps into her former friends and acquaintances all seems to be as it was before she left. Until she comes face to face with London at a party. Yes. The London. The dead in the boat London. Everyone acts like everything is normal and that Chloe is being the odd one out. Nobody questions Londons existence. As time goes by parts of the story unravels and the reader- along with Chloe -discover the real Ruby. However Chloe doesnt want to believe the new evidence. She idolizes Ruby and sees no fault. She adores her sister for looking out for her and raising her. She cant put aside these feelings to question Rubys relationships, her lies and her link to Londons death and reappearance. In the end when everything is out in the open only one sister survives. Okay, this book was way odd, weird, macabre, strange, creepy…. gave me nightmares after I finished reading it. I didn’t necessarily like the book, mostly because I didn’t like either sister for a multitude of reasons. However it was well written, highly descriptive, tense and mysterious. Hey all! Could you please spare a minute to help me? My sister and her friend are in the semi finals of a design competition. They had to make an outfit out of reusable material. They designed a beautiful gown out of damaged inner tubes of bicycle tyres, copper wire and old jewellery. Could you please click on the link here. Then click vote, then click west or W if on a mobile device. The dress called Venus by Amy Reilly and Sibeal Fallon should appear. Please click the heart on the image to vote. Thank you! !